To be released soon, Swinging Into The Action (SR Records) with focus on Elvis’ April&June 1972 tour, featuring Albuquerque NM April 19th 1972 and the Milwaukee WI, June 14th, 1972. Both the shows are previously unreleased taken directly from a first generation tape. 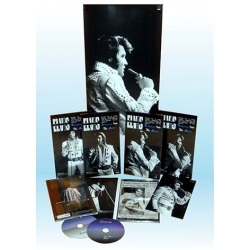 The SR attitude is to present Elvis at the peak of his possibility and without any doubt Elvis’ first two Tours in 1972 present him at the top of his possibilities, delivering maybe shows shorter than the previous November 1971 tour, but still solid. If Rock is an attitude the man still has it. The performances are terrific, rough and sharp. Here are presented two unreleased shows from the April and June tour. Both the show are very similar, the track list is minimized and the shows are practically identical, with some minor exception like the rare “The First Time Ever Saw Your Face “ included in the final Show of Albuquerque..
We are happy and proud of the result we hope you can enjoy too, in spite of the limitation of the audience recording, we are talking of a big Arena shows not of the intimate Las Vegas showroom. The shows are fantastic and the track listing is solid, Elvis is delivering us a sort of greatest hits. Starting from his latest single Until It’s Time For You To Go then with the Anthem An American Trilogy passing the best single of 1969, Suspicious Minds without forgetting the glorious fifties with Heartbreak Hotel and Hound Dog…. All the songs are very well performed.